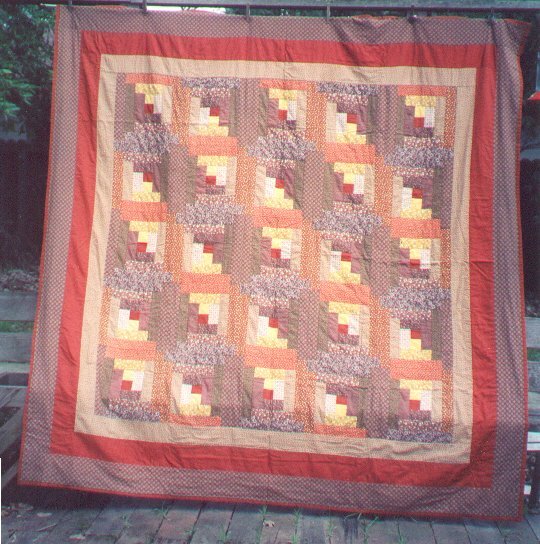 This was my very first machine-pieced quilt ... a king-sized one at that. I had no idea what it meant. :-) I had been sewing for years and years, but clothing only, no quilts. It all looked so simple. :-) And, in reality, the actual construction was. This was a kit from Woman's Day magazine. It included fabric, instructions and a picture of the final quilt. The fabrics didn't coordinate with anything I had in the house ... they still don't! ... but they were pleasing to look at. I don't have fabric samples at this time ... a cursory look in my fabric stash failed to turn up any remants, although I do seem to remember a packet of fabric leftover. When I run across the packet again ... during some spring-turnover [grin] ... I'll scan them so they can be viewed. I came home from work on a Friday afternoon and immediately started sewing ... who cared about dinner? Certainly not me! And Mr. Pirate was (and continues to be) easy-going: popcorn and milk has sufficed for dinner many nights. [grin] Sewing continued early Saturday morning, all day and into the night. Sunday was a repeat of Saturday, but by Sunday evening, the entire quilt was completely done .. all the rows sewn together and all the hand-stitching finished. It was an incredible marathon sewing session. I learned about making log cabin blocks on a muslin foundation .. a technique I still use, over 20 years later. It was also a discovery of the 'quilt as you go' method of quilt construction. The individual blocks were kinda like mini-quilts: the layer of logs was sewn thru muslin, the batting and the backing. The edges of the backing were kept loose, to be hand-sewn down when the blocks were sewn together into rows and then into the complete top. The great thing, for me, about quilt-as-you-to is that when the top is done, so is the entire quilt. The arrangement of the individual log cabin blocks can be done in many, many ways, each resulting in a different look for the finished quilt. This arrangement of blocks is called "Straight Furrows", for obvious reasons, and is one of my favorites.